… for many years my mum has come up to the cottage for her birthday. She loves it here but particularly she loves the beach and more often than not we would spend the day there, with blankets on the sand, windbreakers and deckchairs with enough food to sink the Titanic. The east coast of the UK is a truly beautiful place with very many award-winning sandy beaches that stretch for miles up the coast and are almost always entirely deserted. Amazingly it’s been four years since she’s come up to celebrate her birthday but this last weekend she came with her husband Eric and we essentially spent the weekend eating and drinking. We didn’t actually make it to the beach in the end and the weather has turned a little crappy but we did go for an epic walk on Sunday which included me stubbornly dragging them through the overgrowth where we all received second degree stings from nettles, snags on clothes from the brambles, an invasion of frogs and mum in what can only be described as a tumultuous fall into a bush. They were surprisingly good sports and very sprightly for their combined ages of 152… and we laughed way harder than we should when mum took her tumble. It sounds mean but of course we rescued her from the undergrowth pretty quickly and we were on our way again, chasing ducks and spotting wildlife. Sometimes it’s like being with 4 year old kids! We actually had to ask The Viking to come and rescue us in the end and we’d walked too far. I’m hoping I haven’t damaged them too much! after such a long and exhausting walk a proper Sunday lunch was needed… a chicken was roasted with all the trimmings and pie was made as a substitute birthday cake. 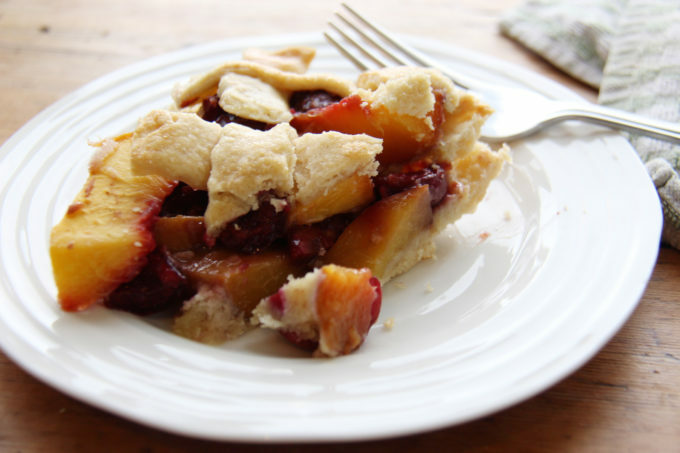 Mum loves stoned fruit such as plums and nectarines and of course peaches and cherries are at their best right now. 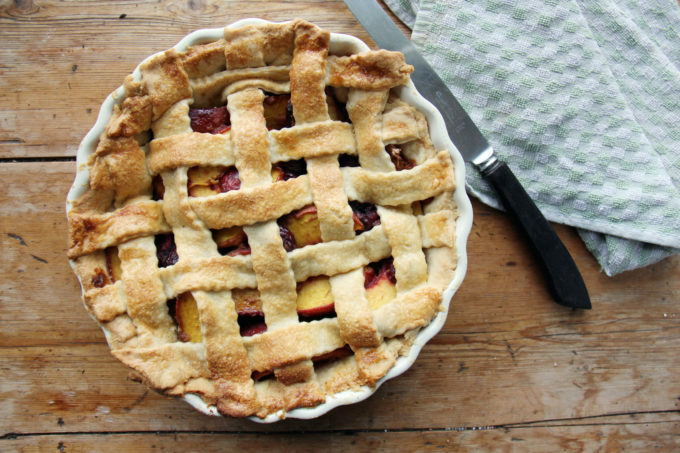 This is a very simple pie to make, although if I was making it again I would either slice the peaches thinner or pre-cook the fruit first for a short burst just to get their juices flowing a little more that they did. Saying that it went down a treat and we served it warm with custard, although as is always my want, I took my slice prior to it being re-heated and served mine cold with cold cream… oh the glory! place all the filling ingredients into a bowl and stir together well (your hands are the best tool for this.) 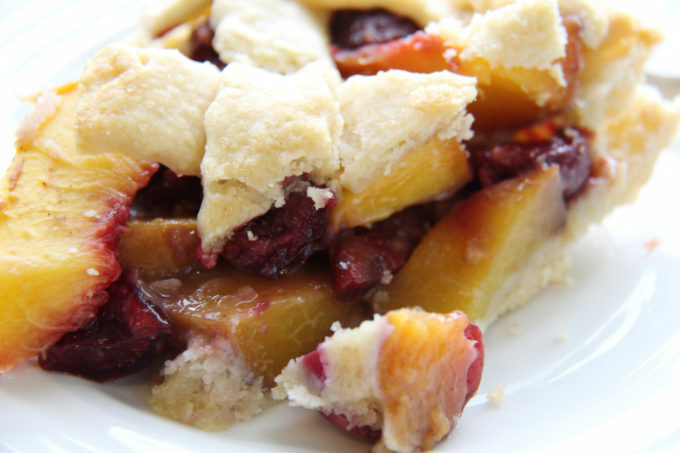 – I would suggest gently heating this mixture for 5 mins to break down the fruit a little but you don’t have to, you’ll get a more ‘compote’ style filling but just as nice – then pour the whole lot into the pie dish on top of the pastry and let it cool completely. bake for 30 – 40 minutes until the pastry is golden brown. It sounds like you had real fun, and there’s so much love and tenderness showing in your post! That pie looks simply mouthwatering, and I’ve gotta try that almond and cream cheese pastry at all costs!!! Oh your poor Mum! Tut tut for laughing at her unfortunate tumble. 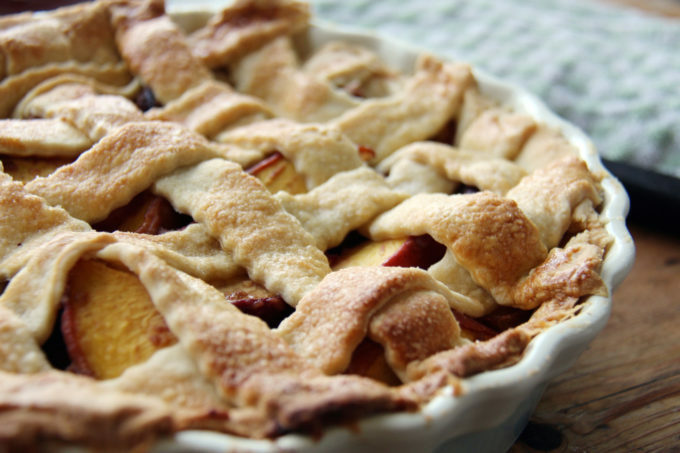 Your cherry peach pie looks most beautiful, I’d love a slice or two. Such delicious flavours. oh I know, I feel very guilty! My tumble is sort of expected in Belleau – sadly The Viking missed it but no doubt there will be another one sometime. This one was caused by bindweed which Dom has failed to mention wrapping itself around my leg. Your poor Mum! Mind you we have had more than a few laughs watching ‘granny’ tumble…. I am sure she was ready for that gorgeous pie. Peach and cherry is one of my favourite pairings. I bet it was just perfect with lashings of custard.